DoN was invited by Debra Leigh Scott to attend an art show and poetry reading at The Enclaves ; you never heard of the Enclaves you say – DoN hadn’t either. 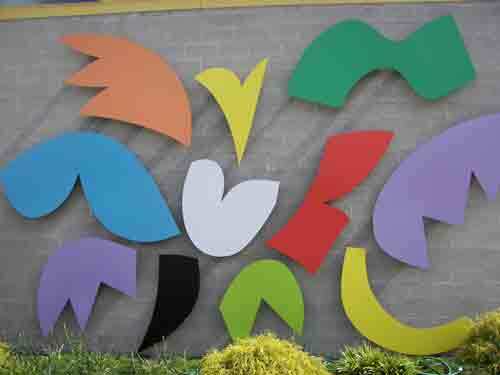 The Enclaves is at the intersection of Penrose & Pattison Avenues near the Platt Bridge and is a high rise development which was artistically enhanced by famed Philadelphian, Sam Maitin. The Clubhouse @ The Enclaves. Wall installation by Sam Maitin @ The Enclaves. This entry was posted in DoNBrewer, Philadelphia, Philadelphia Art, Philadelphia Art Clubs, Philadelphia Art Shows, Philadelphia Artists, Philadelphia Artists, Uncategorized on May 27, 2008 by admin1. DoN visited the Flowers Galore show at The Church of the Holy Trinity on Rittenhouse Square which is held in conjunction with the Rittenhouse Square Flower Market for Children’s Charities. Not only is the elaborate Norman style interior stunningly decorated, there is beautiful stained glass from English, French and American studios including five by Tiffany and one by Luc Olivier Merson. The church is a wonderful supporter of local artists and DoN was surprised by how many of the fifty displayed he’s familiar with; the simple display of each painting on an easel with it’s own spotlight was inventive and a wonderfully modern twist to the Romanesque space. Holy Trinity’s next show is June 6th – June 12th – DoN recommends you not miss this wonderful city landmark and the great images by local artists. Alden Cole @ Flowers Galore. 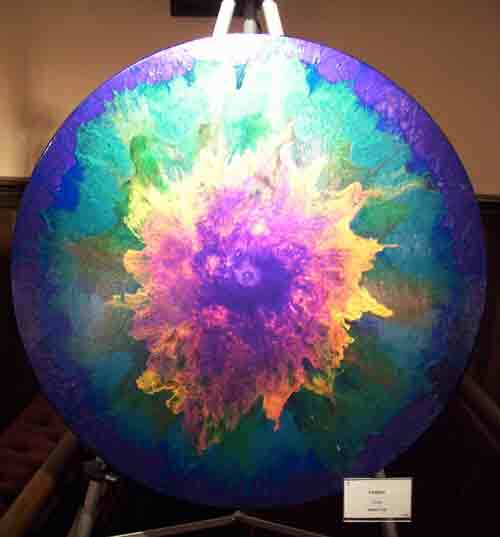 This entry was posted in Design, DoNBrewer, Fabric Art, Glass Art, Multimedia Art, Philadelphia, Philadelphia Art, Philadelphia Art Shows, Philadelphia Artists, Philadelphia Artists, Photography Philadelphia, Uncategorized on May 21, 2008 by admin1. Thursday, DoN visited the Crane Contemporary Arts Center in Fishtown for Second Thursday; Nexus featured Rebecca Gilbert : Dirt Thirst and Virginia Batson: substance, sustenance, Kelly & Weber features Collect. Consume. Rebuild, paintings by Sean O’Neil, The Icebox has Semi, a juried exhibition of works by Tyler School of Art MFA students, Juror: Elizabeth Grady, The University of Delaware has MFA student show in The Triangle Space and Jessica Demcsak – The Crane Adjacent, presented by INLIQUID.COM. I know it sounds like a lot but DoN explored the whole space and has some favorites to share: Rebecca Gilbert at Nexus is showing imaginative prints which are delightful and probably the most accessible and salable art DoN viewed, featuring beautifully crafted small pieces which will enhance any art lovers collection (more about Gilbert later). 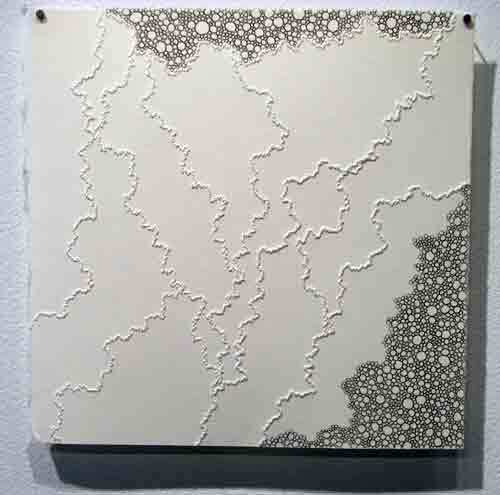 Virginia Batson is showing some really DuChampian “drawings” using drips of salt water (sweat, tears?) on black paper, also lovely small papers with nubby surfaces and fine line work, again perfect art for contemporary interiors. Work on paper by Virginia Batson @ Nexus. Works on paper by Rebecca Gilbert @ Nexus. This entry was posted in Ceramics & Sculpture, Design, DoNBrewer, Fabric Art, Multimedia Art, Philadelphia, Philadelphia Art, Philadelphia Art Clubs, Philadelphia Art Shows, Philadelphia Artists, Philadelphia Artists, Photography Philadelphia, Uncategorized on May 14, 2008 by admin1. 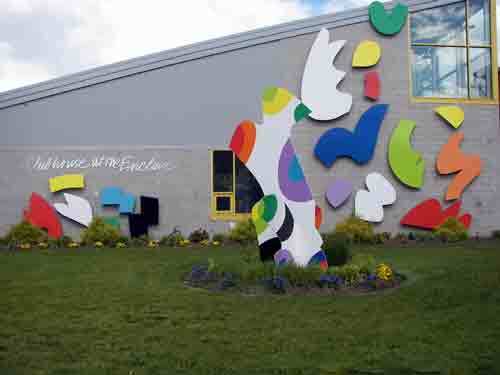 Thursday, Alden Cole and DoN drove to Bethlehem to drop off one of Alden’s fabulous luminaries at Home & Planet, an extraordinary art gallery featuring art created from recycled materials. The gallery was getting ready for First Friday, so we got to see a preview of the featured art which includes some really creative metal constructions by artists Ben and Kate Gatski and welder Lana Garner. Gatski’s installation includes works created for the garden as well as moo-valous steer heads, cows and giant flowers all made with found metal. Quite a-moo-sing. 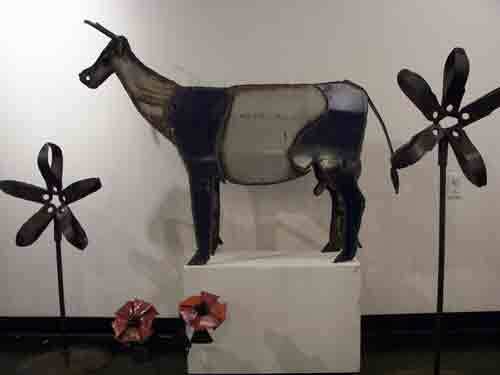 Metal cow and flowers by Gatski @ Home and Planet. 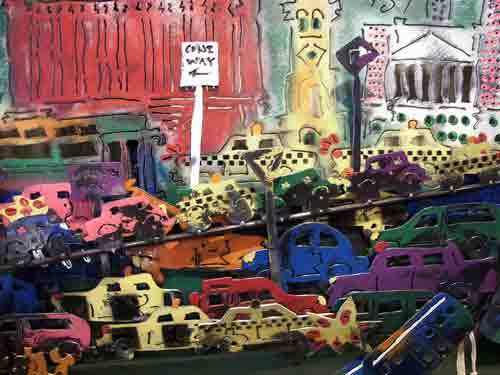 Lana Garner creates signature cityscapes from steel dumpster doors, car hoods and drum barrels – a true dumpster diver. Gritty and bleak, the works portray the urban landscape with humor and inventiveness. Garner was a member of a women’s welding collective called Accoutrements and now lives in South Carolina where she has an old gas station for her studio and an old church renovated to be her home. DoN is fascinated with the scale and scope of these monumental works which are extremely heavy and required industrial strength mountings to hang in the gallery. DoNwas also pleased to see the Philly skyline portrayed in welded metal. Since Bethlehem used to be a steel town, the works by Gatski and Garner are particularly poingnant. 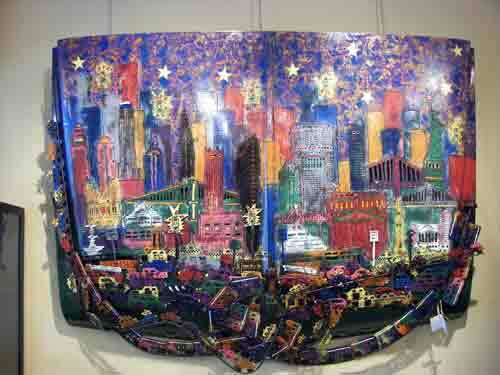 Cityscape on a car hood by Lana Garner @ Home and Planet. Cityscape on dumpster door by Lana Garner with Alden Cole luminary (left) @ Home and Planet, Bethlehem, PA. Detail from Lana Garner’s welded art on an old car hood. 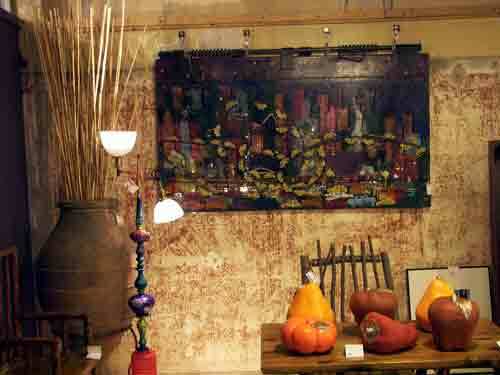 This entry was posted in Ceramics & Sculpture, Design, DoNBrewer, Multimedia Art, Philadelphia, Philadelphia Art, Philadelphia Art Clubs, Philadelphia Art Shows, Philadelphia Artists, Photography Philadelphia, Uncategorized on May 6, 2008 by admin1.